We must adore devoutly this God of ours, hidden in the Eucharist  — it is Jesus himself, born of the Virgin Mary, who suffered and gave his life in the sacrifice of the cross; Jesus, from whose side, pierced by a lance, flowed water and blood . This is the sacred banquet, in which we receive Christ himself. We renew the memory of his passion, and through him the soul is brought to an intimate relationship with God and receives a promise of future glory . The liturgy of the Church has summarised, in a few words, the culminating points of the history of our Lord’s love for us. The reason Msgr. Romano Guardini gives for God being deserving of adoration is because He is the Creator and consequently is all good, holy and true; that it is that holiness which makes him worthy and omnipotent. Therefore adoration is an act that makes sense; one bows one’s body and soul before His omnipotent Creator. 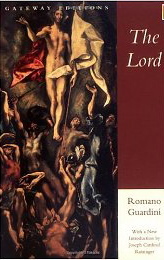 Guardini also stresses the grandeur of spiritual purity with not only the body, heart having purity but also the soul; all of which are essential for the health of the entire person created in the image of God. He elaborates eloquently: “The purity of the spirit is dependent upon truth. A spirit is pure when it makes clear-cut distinctions between great and little, good and bad; when it refuses to bend yes into no and no into yes, but keeps them undistorted by a straight either-or. This does not mean that with the resultant clarity the good is also already accomplished and the bad avoided; it means something much more elementary: that virtue is never called vice, and vice virtue. Purity of spirit lies at the beginning of things, there where the first stirrings set in, where conceptions of being and doing are formed. It is that initial authenticity to which the true meaning of words is grounded and their relation to each other is corrected, their edges trimmed. Spirit becomes impure through essential dishonesty. When it attempts to call evil good, it becomes essentially corrupt. A lie is always evil, but worse than its conscious evil is loss of the fundamental sense of truth. The spirit that errs is not yet impure–for example when it judges facts falsely, uses words incorrectly or confuses images. It is impure when it is indifferent to truth; when it no longer desires to think cleanly or to measure by the standards of eternity; when it no longer knows that the dignity and honor of truth are its own dignity and honor; when it besmudges the sense of word which is the sense of things and of existence itself, robbing them of their austerity and nobility.